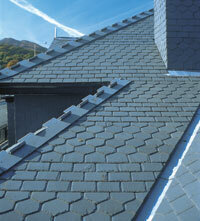 Evergreen Slate is the largest producer and supplier of slate in the United States. Since 1916, the company has taken pride in providing its customers with high-quality products and excellent customer service, as the leader in the slate roofing industry. The thousands of roofs we’ve provided to fine homes, churches, libraries, government buildings and universities for almost 90 years are a testament to our role as the premier Slate Roofing Tile provider. Slate quarried for roofing stock is of dense, sound rock and exceedingly tough and durable. Vermont Natural Slate roofs have lasted a century, giving excellent long-term value, in contrast to other types of manufactured roofing which must be re-roofed three or four times within this same period. Vermont Natural Slate Roofing and Natural Slate Roofing Tile colors, sizes and texture afford many architectural effects, contributing to the appearance and beauty of any building. Our experienced staff can provide detailed information and architectural services from single size 1/4" thickness applications to intermingled rough texture in random widths to graduated length and thickness. Evergreen sources its slate from some two-dozen different quarries and offers 14 different color choices. 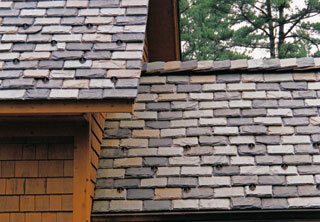 All of our Vermont Slate has been tested according to ASTM guidelines and has received the highest ranking.